If the last two novels I had read before this had been Paul McAuley's The Quiet War and Bruce Sterling's The Caryatids then I may have nudged my rating into the 4-star category but they weren't. Instead they were Sylvia Townsend Warner's Lolly Willowes, Mr. Fortune's Maggot and Summer Will Show, and Piercy's writing style suffered by comparison (IMO, of course). Another strike against the novel was that I wasn't able to "get into it" for the first 100 pages or so. However: It got better. The writing, while never on the level Warner seems to reach effortlessly, did improve and there were some scenes that did leap off the page. And after Chapter 4, it became easier for me to empathize with Connie and enjoy her trips to the world of 2137. One of my groups is reading the book this month (March 2010) so I'm going to hold off on a more thorough (and spoiler-laden) review until later this month, hoping to get some insights and different POVs from the discussion threads. 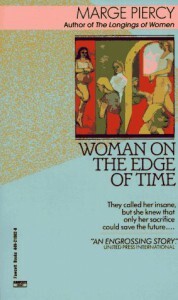 Woman on the Edge of Time (WOTEOT or Woman) is an interesting if not especially well written entry in the utopian/dystopian genre. It describes a future Earth where hierarchies have disappeared, gender roles are nonexistent, communities live in sustainable harmony with their environments and people realize their potentials. (Some people commented in the reading thread that it seemed dated in places because it was written in the '70s but I found its interest in the environment, war, out-of-control technology and social pressures to conform very contemporary.) The future isn't perfect. There's still the specter of a war against the remnants of the earlier machine, exploitative civilization (i.e., us - the 20th Century). But that culture only clings to a few enclaves on Earth and some space stations. We find out about this future through the psychic journeys of Consuelo (Connie) Ramos, a middle-aged Chicana whose life has been stifled by all the problems the future has solved. The promise of a better life was quashed when she had to drop out of college after only 2 years, having gotten pregnant by her first husband. When another lover, Claud (the only decent relationship Connie ever had), dies, she descends into a haze of depression and alcohol, loses her daughter and spends some time in a mental institution. When she tries to protect her niece Dolly from her pimp/boy friend, Connie winds up in an institution again because she's a "threat" and prone to violence. Just prior to this, Connie had been visited by a vision of Luciente, who turns out to be from 2137. Connie is a prime "receiver," and can travel with Luciente to the future, where she has a physical existence and can interact with the people she meets there in a limited way. Meanwhile, as Connie learns about the future, in the present she and her fellow inmates are threatened by a scientist who wants to experiment with brain surgery to "cure" them. For me, the selections of the novel set in the mental ward were the most affecting. Piercy manages to generate a real feeling for the helplessness and despair that its inmates feel as their lives are destroyed by the callous indifference of the staff, mental and physical abuse, and the determination of the doctors to try out their pet theories about mental health. The authors uses the future to highlight these cruelties in comparison as well as other issues that resonate today - the environment, gender conflict, war, individuals vs. community, and others. I would argue that, in the end, the future Connie visits is a hallucination that her mind constructs to give her the tools she needs to finally act against her oppressors. The ending is poignantly bleak - her rebellion is no more than a passive-aggressive attack against her immediate enemies - the doctors tormenting her and her friends. Connie manages to avoid further brain surgeries but is unable to escape her imprisonment, and ends up institutionalized for life. There's a glimmer of hope that her action may have allowed her friend Sybil to escape but the reader is left in the dark about that; and there's no certainty that Luciente's future is the real one as she has pointed out earlier that her reality is merely a possibility. I give WOTEOT a qualified recommendation. I enjoyed it eventually and found a lot to admire and hope for in Piercy's vision of the future, and I would certainly recommend it to the utopian/dystopian reading crowd.